We woke up this morning at Archway to snow falling and the ground covered in white. That didn't keep our rider's away though. They came and rode their horses, who were a bit fresh but appreciative for the exercise. During the holiday break we have been doing a different format for lessons. Our rider's come between the hours of 9am and 1pm Tuesday through Friday. They hack on their own and then get to jump over the set course. This allows them the flexibility to fit riding in with other fun activities they have planned during their winter vacation. Greetings Our June 6th Lesson Program Schooling Show was a huge success from beginning to end. On Saturday preparations began with bathing horses/ponies, scrubbing tack, setting the course, and braiding our faithful steeds. Our braiders included Corey, Payton, Krista, Kelsey, Ana, Lauren, Sophie, Alexa and Gina the horses/ponies looked beautiful. As the big day arrived all was in order for the competition to begin. Our Instructors Ana and Lauren along with the Mentors were ready to greet our students with a big smile and positive energy. The barn was abuzz with the air of competition and success!! This year we implemented the Mentoring Program where our Competition riders teamed up with a Lesson student to guide them through all the in and outs of preparing for competition. 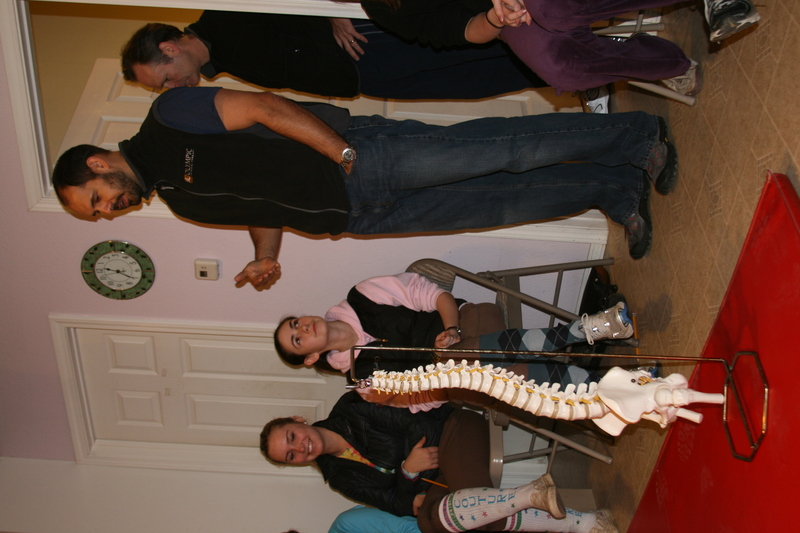 This program was a huge success and allowed each student to have personal attention throughout their experience. A big thank you goes out to our Mentors: Nicole, Cady, Sophie, Payton, Jenna, Melanie, Kelsey, Mali and Alexa you girls were great. Gay Sheridan was our judge, Ana designed our color coordinated courses, Robin ran the show office, Natalie was our back gate/announcer and Erin was our ribbon girl, they were each instrumental in maintaining a smooth flow throughout the day, Great Job Officials and Show Staff. In our spectator section we had Moms, Dads, Grandparents Brothers, Sisters and Friends all here to cheer everyone on. I had a wonderful time greeting and visiting with all our clients. Our Lesson Program parents provided all the tasty food for a wonderful potluck starting with muffins and fruit salad and ending with a delicious Mexican themed lunch. Don’t you just love Potlucks?!! I was impressed with how each rider improved and became more comfortable as the day progressed, all the riders created their own success and each one should feel proud of their accomplishments, keep up the good work. We feel very fortunate to have these uniquely wonderful individuals that make up our Archway Family. Be sure to check our website for individual results and lots of photos!! Join us for the Jeff Cook clinic starting at 9am Saturday, March 27th. The clinic will have three divisions and there is a wonderful heated viewing area for auditors. We will serve lunch in our Archway Cafe for all! Are you ready? Our Jeff Cook clinic is happening this coming weekend. Saturday and Sunday the sessions will begin with the 3' riders at 9am. The 3'6" session follows at 11:30 and the 3'9" session at 2:30.On Saturday, our concession stand will be serving penne bolognese, salad and french bread for lunch. Of course we will have lots of homemade goodies and for the earlybirds, coffee and pastries. We have loads of room for spectators in our heated viewing area. Remember, there is no auditing fee for the competition riders at Archway! Today, my post is about a blog. Following is an excerpt from a wonderful gentleman named Rick. It is worth your while to subscribe to his blog. He is a radio host/author residing in Arizona and here is the link: http://thehorseshowblog.blogspot.com/His unique perspective and writing style is worth your time. Are you ready for the April shows? Check with Corey to be sure you have everything you will need for those first few shows. There seems to always be something that has gone missing since last season. Have you joined WSHJA? This is YOUR local organization that rewards its membership with year end awards. Also, is your horse or pony registered with all the required associations? Those of you on the competition team should check with Corey to be sure all your cards are in order. You should have a USEF card for your horse/pony. A USEF card for the rider, a WSHJA membership and, if you are entering any medal classes, you should have an ASPCA card (this is for the Maclay). Happy riding. These lessons in March are a count-down for the shows in April. Our back gate workers. We also had Hannah T. and Payton volunteer their time at the back gate! What a beautiful day we had for a schooling show! It reached a cozy 56 degrees and the horses and ponies showed how much they enjoyed the sun by behaving wonderfully. So many people were responsible for such an organized show that I will have to thank them in a separate post. Our concession stand was full of yummy home-baked goodies and even had hand-packaged horse treats to buy. Riders, parents and siblings kept a constant stream through the cafe door and we made a brisk business. Each of our divisions filled and everyone won their fair share of ribbons. Some great outside horses attended and we were excited to see new faces from our industry. We love seeing the support the riders have. From younger brother or sisters staying all day to watch, to moms or dads busily videotaping rounds, to dads just holding precious ribbons. Riding is truly a family affair. Our riders couldn't do it without the financial and emotional support of their exended family. We applaud you - the support team outside of the barn that help our riders! We had ponies, we had horses. Some jumped small. Some jumped big. Some rode their own horse, some rode on borrowed mounts. We had beginner riders to the advanced rider. What a great day to get some practice in for the show season, or just get in some practice. The older riders got to help the younger ones and the horses all got BATHS! Until next time... The team at Archway. Come on out and attend our schooling show! Pack up the kids and grandma and make the picturesque drive to our farm just outside of Mill Creek. Not quite 'the country' but 15 acres positioned smack in the middle of some very beautiful homes. 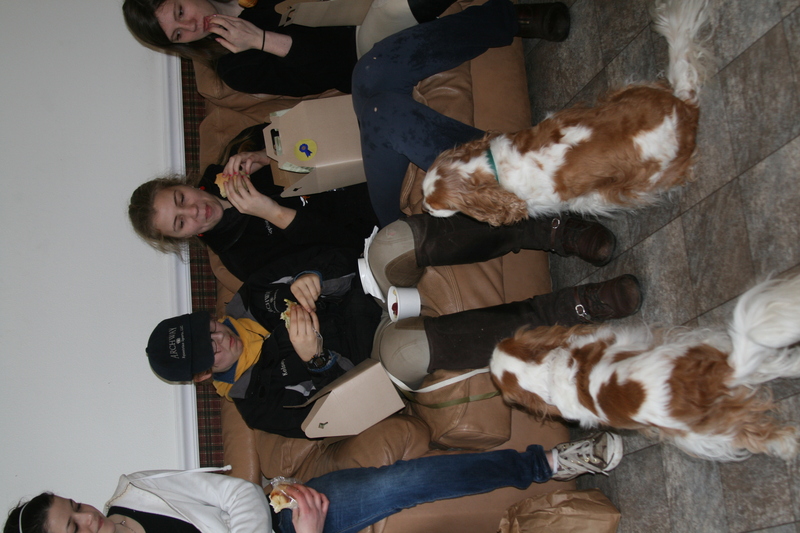 Our schooling show begins at 10am Sunday, February 21st and we will have plenty of excitement and food for all. Catch our riders and horses (and yes, the ponies will be showing too). This is their chance to show how hard they have been working all winter. We're gearing up for our February schooling show. It's time to get your entries in! For a printable entry form and schedule go to our ARCHWAY website. Great ribbons and prizes! Our famous concession will be open with all proceeds going to the Archway Scholarship Fund! Preparation is underway for our next schooling show on February 21st. Our riders had a lot of fun, as well as the visiting barn riders and their coaches. We will again offer our concession, with proceeds to go toward our Archway Scholarship Fund. Give us a call for more information or go to the our WEBSITE to get additional information, an entry form or a schedule. Wow, what a weekend! A great, successful weekend but a long one. Although the highlight of the weekend ended on Sunday with our very successful schooling show, it began for me on Thursday. Thursday is the day the Krista and I spend a lot of time schooling horses/ponies over the course to prepare them for their riders on Friday. It's quite a lot of horses to jump if you add them up. The unique thing about this Thursday is we had all our newly painted brush boxes (with brush) and new bright colored flower boxes added in. The first few horses were good with not a lot of drama (I expected drama). But then I got on a handsome burly dark brown gelding who I won't name but his name starts with a G. Now I knew that this particular guy had a little issue with the girly pink flowers a couple days prior. So I was prepared for a potential confrontation but was going to give him the opportunity to prove me wrong. Well, he was totally fine about the pink flowers...... but...... he had a big problem with the outside line that had the brown brush boxes. Now of course I took it slow and let him take his time to walk by it both ways and go up close to sniff it out. But he was a little too persistent about making a big deal out of this line and started to hop up and down. Now all this was about not wanting to walk up to the jump and take a closer look. As he continued to hop up and down I decided I better let him know who's boss. Let's just say I don't respond to small threats very well so I proceeded to take him in a tight spin to the left and then to the right and the whole time I'm thinking of Angelina Jolie in the movie "Mr & Mrs. Smith" (I'm Mrs. Smith in this scenario :) saying out loud "who's your daddy Now!" Well he got the point. He may be the cool kid in Junior High but he sure does not know how to handle a confrontation especially when it's a girl. Turns out he jumped around the course after that just beautifully and was glad to hear a good report about his Friday Lesson. So Saturday was the next day of preparation for the Schooling show. When I headed down to the barn mid-morning it was absolute chaos in the wash racks as all the riders were waiting for the opportunity to give their horse/pony a bath. Later in the day was spent going to Costco to buy food for our concession stand "The Archway Cafe". After delivering that to the clubhouse and doing the necessary set up in the kitchen it was time for a break. Then Clare and I went back down to the barn to set a course for Sunday. We wrapped that up at about 8pm. Big thanks to Brandan for helping with the concession set-up and the course set. I slept real good that night!! Sunday my alarm went off at 5am. Felt so wrong for a Sunday, especially in January, but up I rose. First thing first was to do the Starbucks run. Thank goodness for Starbucks!! Then down I went to polish my boots and check in on everything. Then I went in to start up the Archway Cafe. It was wonderful to see our students out hacking their horses before sunrise to prepare for their classes. A few students braided their horses as well. Let's not forget the Dad's who brought their daughter's for their early arrival. The show was a great success and our horses and rider's all did fabulous. Words of wisdom: "Eyes up and heels down"
PS I slept great on Sunday night too!! How very lucky we are to have such wonderful opportunities such as the one we had this past weekend. John Rumpeltes (Hannah's dad) and Ben Kossick gave an incredible seminar on warm up and functional training with specific tailoring to the sport of riding. From specifically targeted warm ups to a lesson on the functionality of our bodies as it pertains to our riding (specifically our 'core' muscles and how to engage them). Thank you John and Ben for a very comprehensive and fun afternoon! You got us excited to reach our full potential! Saturday was also the first event in our new fundraising effort to help riders offset expenses for finals competitions outside of Washington State. You'll hear more about this program over the next few months as we introduce fun ways for contributors to support their fellow riders. As a small kick off event, Leslie and Hannah Thornton organized super tasty and healthy box lunches, with all of the proceeds to benefit our traveling finals riders. Hey, haven't you guys heard of sharing? please please? The riders were given a pop quiz after the seminar. A correct answer received a cool Olympic Physical Therapy's Athletic Engineering logo'd hat. Congrats Briteney! Amanda got an answer correct also. 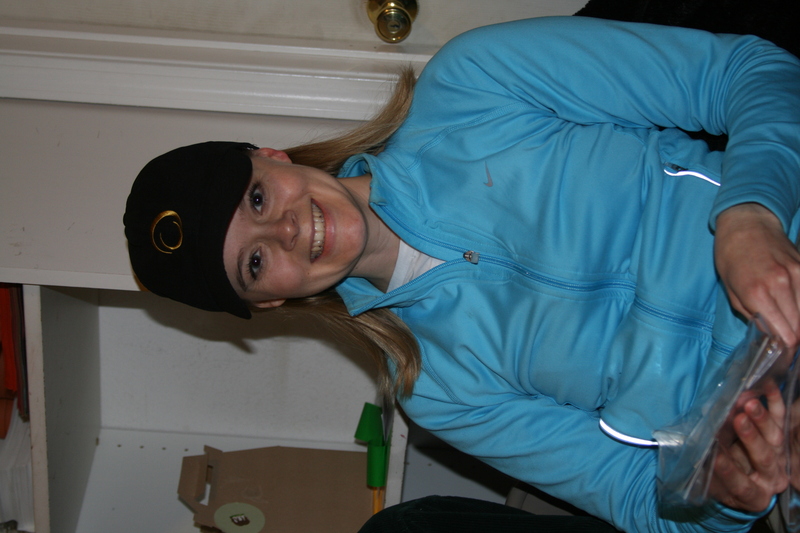 All trainers received new hats! Krista and Clare showing off the goody bags John handed out. Archway hosted a Sports Psychologist Workshop on Saturday, January 16, 2010 here from 9am – 11am. Dr. David B. Coppel, Ph.D. is a respected clinical psychologist, neurophysiologist, and sports psychologist. He is a professor at the University of Washington and over the past twenty-five years, Dr. Coppel specializes in sports psychology (or performance psychology), through research, teaching classes, and conducting workshops for athletes and performers. He provides consultation for athletes, performers, teams, and coaches at the amateur, collegiate, Olympic, and professional competitive levels. He contributed to the book Sport Psychology Interventions by writing Chapter 8/Relationship Issues in Sport: A Marital Therapy Model. He spoke to the older riders first. It was a packed room, with many present to learn some techniques to help their riders too. We then broke for a few minutes and the younger riders came in for their session. It was a bit shorter but packed with tools for the psychology of the sport nonetheless. Everyone came away with new observations, insight and tools to help them overcome their nerves and inability to keep the focus during critical performance peaks. It was a successful and informative day. Watch the blog for dates of additional upcoming events here at Archway. All of us here at Archway Equestrian Sports wish our clients, vendors and friends a wonderful and safe New Year's Eve! Watch for upcoming posts with information about our January clinics. Team Archway: Clare, Ricardo, Corey, Krista, Robin, Julie, Valerie, Javier, Hector and the supporting grooms. We appreciate all of you who braved the 'possible' snow reports to attend our holiday party. The afternoon started with a bang and a song. The lip sync routines were fantastic! We had Jenna, Madelyn & Payton dancing to Party In The USA; Amanda and Natalie with Evacuate the Dance Floor and a 'surprise' duo dancing to Bye Bye Bye (Amanda as Justin Timberlake and Mike). We had a slight glitch in the amp for one of the numbers but the dancers were pros and continued through almost all of their routine. The finale was SO much fun! With only 2 rehearsals they did an abbreviated, simple version but fun nonetheless! We even had a few last minute dancers come up from the audience to join our Thriller routine. Judges Michael Mohn and Gay Sheridan were fabulous and had such a hard time judging that it was decided all participants would receive beautiful dog tags with a musical note on one side and "2010 Archway lip sync participant" etched on the other. *Check out the video at the end of this post! The food was fabulous and the auction a great success. We had many unique or one-of-a-kind items. We even had a donated saddle! Many gift baskets were available and some fun gifts of service like a week's worth of dog watching donated by Kelsey Cordell. Thank you all who donated items or time to make our holiday party such a huge success. Thanks also to our hard working team of 'elves' named below. We truly appreciate your business and look foward to a winning 2010! Robin Cordell Julie Sanborn Ana Sanborn Jacquie Kelsey Cordell Joseph Cordell Ricardo (mmm, mmm good chili!) Kevin Goyena (Thriller choreographer & teacher) Donna Mohn Jordan Payton & Jenna Everyone who donated appetitizers, drink & food for the feast Amanda & Melani for spending hours hanging the garland all our staff who cleaned, swept, hung, decorated and in general WENT ABOVE AND BEYOND!! The garlands were hung with much gusto and fun. Sparkling lights strung and the coke machine wrapped tight. Now auction items, all party hams all spirits and good cheer! Bring warm clothes, empty tummys and quite possibly a reindeer! Now dash to the barn, dash to the barn, dash to barn y'all! Have you RSVP'd yet?You've got your warm clothes ready? You're coming...RIGHT ?? You don't want to miss this! The Archway Holiday Party is almost here. Sunday, beginning at 2:00pm there will be great food and entertainment! Get your song for your lip sync routine to Jacquie ASAP so she can get it ready for your performance. Email the name of it to jmoore@hollyhill.com or bring a CD to the barn by this Saturday (tomorrow). Get ready for our Finale! The next rehearsal for Thriller is tomorrow also at 12:30 in the arena. Have you given any thought to your costume? Think ripped and dirty. Remember anything goes for zombies! Preparations are underway for the silent auction. Need some last minute gift ideas? The Archway store will be ready with fun stocking stuffers as well as unique gifts. GET READY FOR THE HOLIDAY PARTY LIP SYNC FINALE!First rehearsal December 6th at noon in the arena. There are many other YouTube videos that have the basic steps down. We will be doing an abbreviated version (the entire song is 5:12) so if you get familierized with the basic moves you should have a lot of fun. Remember THIS IS A FUN FINALE so if you just want to dress up and jump around that's fine. There will be a few core dancers so don't be SHY! We will be having a rehearsal this Saturday, December 6th at the barn. Noon - 1:00pm. Come dressed warm and casual and be ready to rock! Go check out your closet - any old ripped jeans? have fun with your costume! Well, the holidays are upon us. We're working on our holiday decorations and of course, our PARTY! Invitations went out, beautifully and creatively designed by Julie Sanborn. Watch your mailbox! This year the festivities begin at 2:0pm Sunday, December 13th. Have you got your lip sync choreographed yet? We will also hold our famous Silent Auction, sure to be full of exciting pre-Christmas gift giving ideas. As a finale to our Lip Sync extravaganza, we invite everyone to join in for a group performance of Michael Jackson's Thriller! More information to come. There will be a group rehearsal for the Thriller finale sometime the week before. For information or if you would like to help party-plan contact Robin at the office. Get your party clothes ready! We heard about the weather over the past week there at home. Sounds like typical Washington wind and rain. We have been assured all the horses are fine under the wonderful guidance of Krista, Corey, Robin, Valeri and Julie. Of course we knew the horses would be in great hands as we travelled to Akumal, Mexico for a much-anticipated vacation. We spent days walking the beach and exploring Chichen Itza and the Mayan Ruins. Alas, our respite is now over and we should be heading back as you read this. We are rested and can't wait to get back and jump into the holiday season!